Background: Waist circumference (WC) is an accurate and simple measure of abdominal obesity as compared to waist-hip ratio (WHR). The aim of this study was to determine the correlation between body mass index (BMI) with WC and WHR and suggest cutoff points for WC among Rural Malaysian adults. Methods: A cross-sectional study was conducted among 669 respondents from three villages in Tanjung Karang, located in the district of Kuala Selangor. Data collection was carried out by guided questionnaires and anthropometric measures. Results: The prevalence of abdominal obesity for BMI was almost similar for both gender across Caucasian and Asian BMI cutoff points. Based on Caucasian cutoff points, the prevalence of abdominal obesity for WC was 23.8% (male) and 66.4% (female) while for WHR was 6.2% (male) and 54.2% (female). Asian cutoff points gave higher prevalence of abdominal obesity compared to that of WC among male respondents and WHR for both genders. WC showed strong and positive correlation with BMI compared to WHR (in male WC r = 0.78, WHR r = 0.24 and in female WC r = 0.72, WHR r = 0.19; P < 0.001). Receiver operating characteristic curve analysis suggested WC cutoff points of 92.5 cm in men and 85.5 cm in women is the optimal number for detection of abdominal obesity. Conclusions: WC is the best indicator as compared with WHR for abdominal obesity for Malaysian adults. WC is an important measure of abdominal obesity compared to WHR, which can be low in some obese people because of high hip circumference (in denominator). Sometimes it is difficult in clinical setting to obtain an accurate measurement of hip circumference as compared to WC. In another study, WHR managed to identify more women in the underweight and normal groups as abdominally obese than did WC. A high WHR in a nonobese woman would also suggest that the hip circumference was low. Although many research works have been done worldwide on various aspects of anthropometric measurement to predict the risk of obesity-related diseases, the correlation of BMI with WC and WHR has seldom been addressed among Rural Malaysian population. The aim of this study was to determine the correlation between BMI with WC and WHR and suggest cutoff points for WC among respondents from three villages in Tanjung Karang, Selangor, Malaysia. A cross-sectional study was conducted among Malaysian population in three villages in Tanjung Karang, located in the district of Kuala Selangor about 15 km away from the town of Kuala Selangor, Malaysia. Malaysian citizens aged 18 years and above were recruited to participate in the study, which was carried out from June to September 2011. The simple random sampling procedure was used to choose the respondents from the name list of villagers. Those who refuse to participate and pregnant women were excluded. The total sample size of 669 was calculated  with mean difference and combine the standard deviation (SD) of WC (n = 360, mean: 89.90 [10.78] for male and WC (n = 412, mean: 88.02 [12.23] for female. Data collection was carried out by guided questionnaires consist of two sections; section A for baseline characteristic and B for anthropometric measurements. WHR was calculated by dividing WC (in cm) by hip circumference (cm). Hip circumference was measured at a level parallel to floor, at the largest circumference of the buttocks. The cutoffs points (Caucasian) of WHR used (>1 in men and >0.85 in women)  and cutoffs points for Asians used (0.95 in men and 0.80 in women)  denote abdominal obesity. Average of two readings was used for analysis. The study was approved by the Medical Faculty, Universiti Kebangsaan Malaysia. Permission to enter the villages was obtained from the head villages and the respondents provided with informed consent. All co-researchers were briefed and trained before data collection. Data were analyzed using SPSS version 19 (IBM SPSS Statistics for Windows, Armonk, NY: IBM Corp) for descriptive and correlation analysis. Descriptive analysis used for continuous variables was mean and SD while categorical data were presented as frequency and percentage. Pearson's correlation (r) was conducted to determine the correlation of BMI with WC and WHR. Receiver operating characteristic (ROC) curve was used to show if the optimal cutoff points of WC for this particular population is similar or different with the standard cutoff points for Caucasian. Statistical significance was set at P < 0.05. [Table 1] shows that out of 669 respondents, 273 (40.8%) were male and 396 (59.2%) were female. Female had higher mean of BMI compared to male respondents while males had higher mean of WC and WHR compared to female respondents. BMI cutoff points for Caucasian identified lower total prevalence of overweight and obese compared to cutoff points for Asian (44.2% and 60.0%, respectively) [Table 2]. Among the male respondents, Caucasian BMI cutoff points showed lower prevalence of overweight and obese respondents compared to Asian cutoff points. Nevertheless, Caucasian BMI cutoff points showed higher prevalence of overweight respondents compared to Asian cutoff points among the female respondents. [Table 3] indicates that, based on Caucasian cutoff points for WC and WHR, the male respondents had the prevalence of abdominal obesity of 23.8% and 6.2%, respectively. Whereas. Asian cutoff points for WC and WHR identified higher prevalence of abdominal obesity among the male respondents (37.4% and 26.4%, respectively). Both cutoff points identified similar prevalence of abdominal obesity for WC among the female respondents. However, the Asian cutoff points for WHR showed a higher prevalence of abdominal obesity among female respondents. [Table 4] illustrates the Pearson correlation between BMI with WC and WHR. WC was moderately strong and positive correlated with BMI (r = 0.727, P < 0.001) while WHR was poorly and positive correlated with BMI (r = 0.176, P < 0.001). Results also indicated that WC was better correlated with BMI as compared to WHR for both male and female. 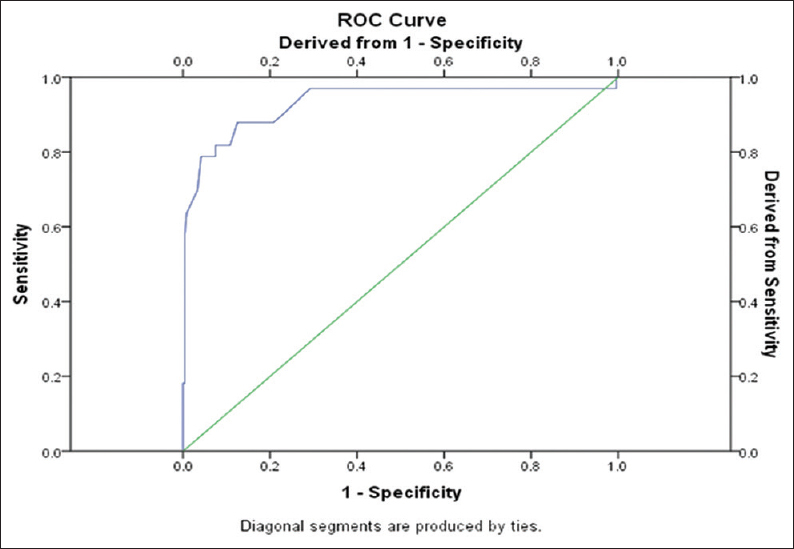 [Figure 1] and [Figure 2] indicate the ROC curve for both male and female, the cutoff point of WC among male at optimal sensitivity (87.9%) and specificity (82.9%) was 92.5 cm (area under the curve [AUC] = 0.93; 95% confidence interval [CI] = 0.87, 0.99), which is near to Caucasian cutoff point, and among female the cutoff point at optimal sensitivity (94.0%) and specificity (55.4%) was 85.5 cm (AUC = 0.87, 95% CI = 0.83,0.91), which is higher than the Caucasian and Asian cutoff points. In our study, the prevalence of abdominal obesity using WC was higher than using WHR. 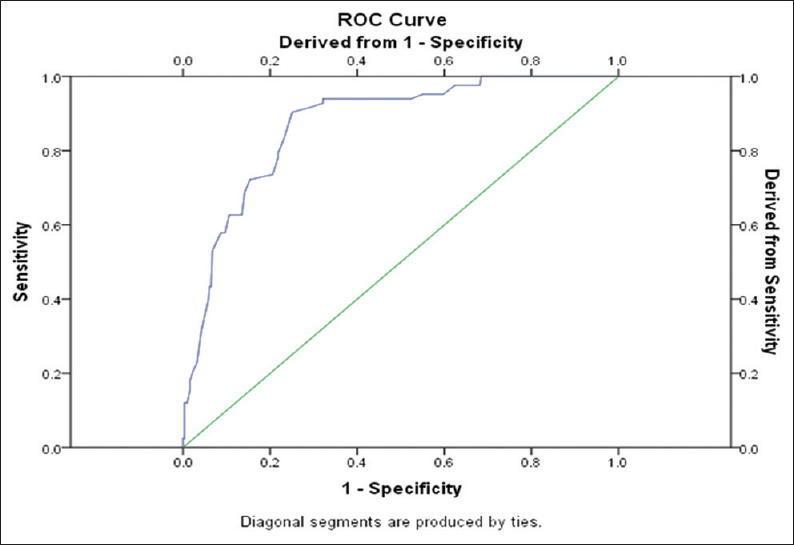 The WHR for both standard and Asian cutoffs detect more underweight and normal respondents as being abdominal obese may be attributed to the small hip circumference (in dominator) leading to high WHR. This is consistent with the finding among the Indian population. The limitations of our study were due to primarily the study among population not differentiated by socio-demographic characteristics such as age or ethnicity. Secondly, due to multiple missing data which prevent further analysis. However, the large sample size in this study make our results useful as a baseline data for future research, especially focusing on waist circumference as a screening tool for abdominal obesity. The WC shows strong and positive correlation with BMI as compared to WHR. 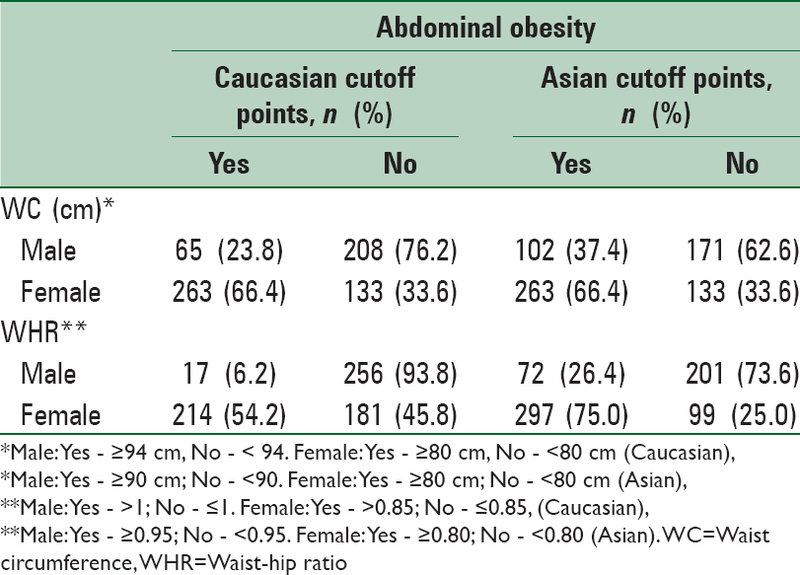 Using both Caucasian and Asian cutoff points, the prevalence of abdominal obesity using WC were found to be higher than in using WHR, as the WHR for both Caucasian and Asian cutoffs detect more underweight and normal respondents as being abdominally obese. The optimal cutoff points of WC for detecting abdominal obesity in this adult Malaysian population were somewhere in between the Caucasian and Asian cutoff points 92.5 for males. The optimal cutoff points for WC among female was found to be higher than both Caucasian and Asian cutoff points. We would like to thank the village heads and respondents of Kampung Api-Api and Kampung Kuantan, Kuala Selangor, Selangor for their kind and unlimited cooperation and support. We also would like to acknowledge the 3 rd Year Medical Students (2011/2012) of Faculty of Medicine, UniversitiKebangsaan Malaysia Medical Centre for their involvement during the initial data collection of the study. Vazquez G, Duval S, Jacobs DR Jr., Silventoinen K. Comparison of body mass index, waist circumference, and waist/hip ratio in predicting incident diabetes: A meta-analysis. Epidemiol Rev 2007;29:115-28. Paniagua L, Lohsoonthorn V, Lertmaharit, Jiamjarasrangsi W, Williams MA. Comparison of waist circumference, body mass index, percent body fat and other measure of adiposity in identifying cardiovascular disease risks among Thai adults. Obes Res Clin Pract 2008;2:215-23. World Health Organization (WHO). Waist Circumference and Waist-Hip Ratio. Report of WHO Expert Consultation. Geneva: World Health Organization; 2008. Yanga F, Lv JH, Lei SF, Chena XD. Receiver-operating characteristic analyses of body mass index, waist circumference and waist-to-hip ratio for obesity: Screening in young adults in central south of China. Clin Nut 2006;25:1030-9. Mamtani MR, Kulkarni HR. Predictive performance of anthropometric indexes of central obesity for the risk of type 2 diabetes. Arch Med Res 2005;36:581-9. Cheng CH, Ho CC, Yang CF, Huang YC, Lai CH, Liaw YP. Waist-to-hip ratio is a better anthropometric index than body mass index for predicting the risk of type 2 diabetes in Taiwanese population. Nutr Res 2010;30:585-93. Hajian-Tilaki K, Heidari B. Is waist circumference a better predictor of diabetes than body mass index or waist-to-height ratio in Iranian adults? Int J Prev Med 2015;6:5. Sanya AO, Ogwum Ike OO, Ige AP, Ayanniyi OA. Relationship of waist-hip ratio and body mass index to blood pressure of individuals in Ibadan North Local Government. AJPARS 2009;1:7-11. Kurpad SS, Tandon H, Srinivasan K. Waist circumference correlates better with body mass index than waist-to-hip ratio in Asian Indians. Natl Med J India; 16:189-92. Snedecor GW, Cochran WG. Statistical Methods. 8 th ed. Ames: Iowa State Press; 1989. Zimmet PZ, Alberti KG. Introduction: Globalization and the non-communicable disease epidemic. Obesity (Silver Spring) 2006;14:1-3. World Health Organization (WHO). The Problem of Obesity; 2000. Available from: http://www.whqlibdoc.who.int/trs/WHO_TRS_894_(part1).pdf. [Last accessed on 2015 Aug 15]. Ministry of Health (MOH). The Third National health and Morbidity Survey (NHMS III). Vol. 1. Malaysia: Ministry of Health (MOH); 2006. Kee CC Jr., Jamaiyah H, Noor Safiza MN, Khor GL, Suzana S, Jamalludin AR, et al. Abdominal obesity in Malaysian adults: National health and morbidity survey III (NHMS III, 2006). Malays J Nutr 2008;14:125-35. Wang F, Wu S, Song Y, Tang X, Marshall R, Liang M, et al. Waist circumference, body mass index and waist to hip ratio for prediction of the metabolic syndrome in Chinese. Nutr Metab Cardiovasc Dis 2009;19:542-7. Humayun A, Shah AS. Comparison of body mass index and waist circumference in predicting incident diabetes. Pak J Physiol 2010;6:47-9. Neovius M, Linné Y, Rossner S. BMI, waist-circumference and waist-hip-ratio as diagnostic tests for fatness in adolescents. Int J Obes (Lond) 2005;29:163-9. Marjani A. Waist circumference, body mass index, hip circumference and waist-to-hip ratio in type 2 diabetes patients in Gorgan, Iran. J Clin diag Res 2011;5:201-5. Zaher ZM, Zambari R, Pheng CS, Muruga V, Ng B, Appannah G, et al. Optimal cut-off levels to define obesity: Body mass index and waist circumference, and their relationship to cardiovascular disease, dyslipidaemia, hypertension and diabetes in Malaysia. Asia Pac J Clin Nutr 2009;18:209-16. Xu F, Wang YF, Lu L, Liang Y, Wang Z, Hong X, et al. Comparison of anthropometric indices of obesity in predicting subsequent risk of hyperglycemia among Chinese men and women in Mainland China. Asia Pac J Clin Nutr 2010;19:586-93.